Sussex Inlet is essentially a narrow, attractive, winding stretch of water that connects the Tasman Sea to St Georges Basin. 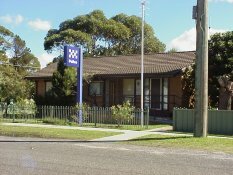 The township (population 2324) is 204 km south of Sydney via the Princes Highway. The turnoff along Sussex Inlet Road is 4 km south of Wandandian. Once occupied by the Dhurga Aborigines the first European settler was Jacob Ellmoos, a migrant from Schleswig-Holstein in Prussia. Ellmoos arrived in Sydney in 1878 then sailed and fished his way south. Having obtained a letter of introduction to the lighthouse keeper at Cape St George on Jervis Bay he set up camp there. During a fishing excursion he came across Sussex Inlet and was captivated by the combination of plentiful fish stocks and a beautiful and tranquil locale. Granted 100 acres of land on the eastern side of the Inlet he proceeded to bring out his parents and siblings. The family erected a guest house, ‘Christian’s Minde’ in 1896, the only one of its kind between Port Hacking, at the southern end of Sydney, and Twofold Bay. The name means ‘Christian’s Rest’ after Jacob’s brother, Christian, who died of pneumonia after surviving several hours in the water when his boat overturned in St Georges Basin. Wandandian, supposedly meaning ‘home of lost lovers’, was settled in the 1850s. Dairying and timber were the initial local industries and mechanical saw milling began in 1910. They have been supplanted by fruit-growing and hobby farms. With a number of lengthy beaches lining the watercourse Sussex Inlet is essentially a tourist resort, ideal for fishing and swimming. The population in 1986 was 1705.